It is universally known that running is good for both the body and soul: it burns calories, reduces the risk of high blood pressure and can beat off feelings of anxiety. But even though the winter evenings and mornings are getting a little bit lighter and ever so slightly warmer – it’s still not ideal exercise weather out there. Cue the trusty treadmill. 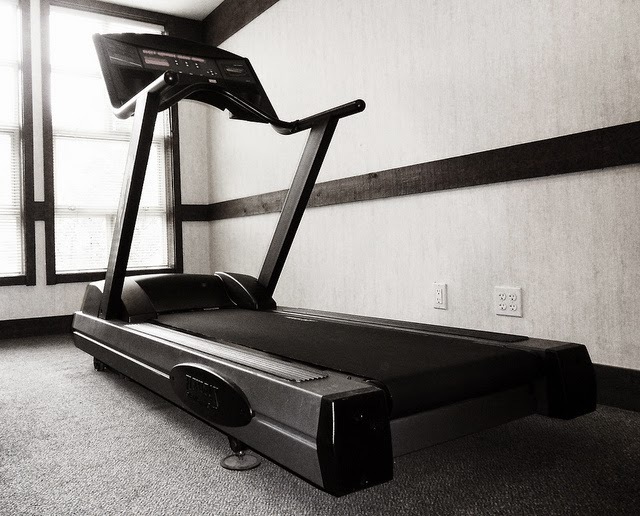 Whether using one at home or in your local gym, treadmills can keep you going through the colder season, especially if you’re training for a race next year (go you!). Let’s take a look at how running machines should be used as part of a healthy lifestyle, whether you’re a newcomer to running or a 10K pro. Perhaps your New Year’s Resolution was to take up running and you just can’t seem to break into it. Starting off on a treadmill means that you can run in safety, with a TV or music to keep you motivated, at a constant pace on a steady terrain. Once you get the hang of it, it’s time to really push yourself: mix up slower paced, incline runs with faster, flat sprints. You can do this by selecting rolling hill and sprint interval settings. This type of training will build muscle and better your endurance, as well as burn off fat. However, it is essential to remember not to overdo it. If you find yourself hanging onto the side bars, the setting is probably too fast; listen to your body and slow it down. Some of you might have been running or working out for a few months or more and are now looking at how to carry on training indoors. Cross training is the best method to really keep your fitness levels up. This involves combining exercises from disciplines other than running. So you might spend one evening on the treadmill then another on the rowing machine, water running or even in a yoga classes. These will improve areas that aren't used very much in running, like upper bodies and flexibility. You’ll be raring to go once the sunshine makes an appearance. One thing a running machine can’t offer you is the unbeatable high of the icy, fresh air hitting your lungs in the great outdoors. If you are adamant on running throughout winter, be sure to wrap up warm with layers (but not too many! ), wear wetness wicking socks and reflective gear, warm up properly and run in a safe area. A study published by Medicine & Science in Sports & Exercise showed that 30 minutes walking on a treadmill can lift the mood of people suffering from depression. This proves the invaluable benefits a stroll, jog or run can do for you, both indoors and outdoors. Start at your own pace and you’ll soon be in the best shape ever. Image by Jennifer C, used under the Creative Commons license. cheapwindowskey.com is a professional and trustworthy online shop, offering all visual studio 2012 key. All visual studio keys are available including Express Edition, Professional Edition, Community Edition, Premium Edition, Ultimate Edition and Test Professional Edition.